The day after a tough workout, you may feel a little tired and maybe even a bit sore. 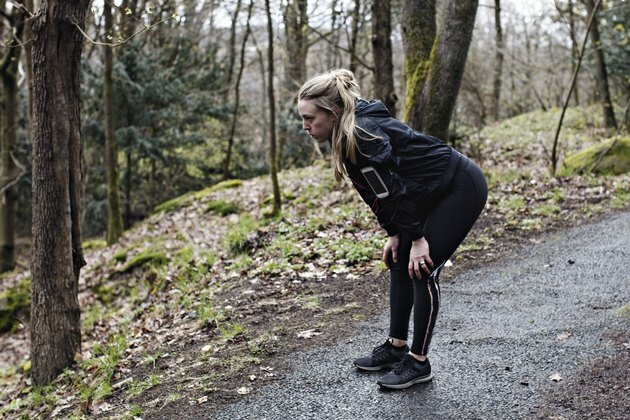 Muscle soreness and fatigue after exercise is not uncommon, but can be minimized with adjustments to your training program, proper nutrition and obtaining adequate amounts of sleep. Pushing your body to the limits can enhance performance, but only if you allow your body proper recovery time following the workouts. It is also essential to replace lost glycogen stores, or carbohydrate stores, in the muscles following your workouts to promote muscle recovery. When your train hard and do not consume an adequate amount of nutrients and calories, your carbohydrate stores become depleted in your muscles and in your liver, which in turn reduces blood glucose levels. As a result, you might have fatigue the day after your workout. Furthermore, not consuming enough protein to help repair and rebuild damaged muscle tissue can also result in fatigue, according to the American Council on Exercise. Read more: How Long Does it Take for Muscles to Recover After Workout? If you are sleepy after a workout, you might need to consider your sleep habits. Obtaining adequate amounts of sleep is essential whenever you train hard. Muscles grow not in the weight room, but during times of rest and sleep. The muscles damaged during your intense weight-training sessions the day before start to repair and rebuild while you sleep. When you are sleep deprived, you will feel fatigued and lack energy while your body tries to repair the muscle. Get a sufficient amount of uninterrupted sleep such that you are completely rested by the time you wake up. Delayed-onset muscle soreness, DOMS, is the muscle soreness often felt one or two days following an intense workout session. DOMS is associated with actual injury to the muscle or micro-tears in the muscle fibers that are caused especially by eccentric muscle action. Eccentric contraction is the lengthening of the muscle whereas concentric muscle contraction is the shortening of the muscle. Examples of eccentric muscle actions include downhill running, jumping and the downward or lowering phase of weight lifting exercises. According to the American College of Sports Medicine (ACSM), pain from DOMS can be decreased with massage, applying ice, trigger point release and oral pain medications. However, the ACSM also points out that while these interventions help decrease pain, they do not speed up muscle healing. Adequate rest is required to heal from muscle damage that occurs during exercise. Reduce the amount of eccentric training when starting a new exercise program. Always stretch thoroughly after an intense workout session to help reduce muscle soreness. Consume a small meal consisting of a carbohydrate and protein source within 45 minutes of exercise when your muscles are primed to absorb the nutrients. Sample meals might include fruit and whey protein shake or a potato and chicken breast or fish. Several hours later, consume another meal to continue to provide nutrients to help your body recover. Finally, allow at least 48 hours before retraining the same muscle group. Never train a muscle group if you are still sore from your previous workout.